Draft: 2015, Washington Nationals, 8th rd. Koda James Glover...Spent two seasons at Eastern Oklahoma State Junior College prior to transferring to Oklahoma State University. Battled right shoulder tendinitis in Spring Training that delayed the start of his fourth professional season...Remained in extended Spring Training before returning to games in early July...Appeared in 11 Minor League games before being recalled on Aug. 8... Pitched to a 1.59 ERA (2 ER/11.1 IP) with a 0.97 WHIP, a .158 opp. AVG and three holds in his last 14 appearances of 2018... Earned lone save on Aug. 16 at St. Louis. Made his first Opening Day roster...Opened the season in a set-up role before moving to the closer role in late April...Recorded five holds as a set-up man...Was placed on the 10-day DL with a left hip impingement on April 26 and again on June 11 (lower back stiffness), ending his season...Despite pitching in only 23 games, he led all Major League rookies with eight saves...Was 8-for-10 in save opportunities...Earned his first MLB save, April 22 at NYM (0.1 IP)...Did not allow an earned run in nine of 10 save opportunities...Surrendered two earned runs in his final outing, June 10 vs. TEX... Offered scoreless relief in 18 of 23 appearances...Allowed only two of 12 inherited runners to score (16.7%). Began the season with Single-A Potomac before being promoted to Double-A Harrisburg, Triple-A Syracuse and, eventually, the Major Leagues...Went 3-1 with eight saves and a 2.25 ERA (14 ER/56.0 IP) in 40 combined appearances...Struck out 66 batters against just 14 walks...Had his contract selected on July 20 and made his MLB debut that night vs. LAD (1.0 IP)...Recorded his first strikeout, July 21 vs. LAD (Maeda)...From Aug. 22-Sept. 6, recorded a 1.00 ERA (1 ER/9.0 IP) with 12 strikeouts, two walks and three hits...He earned his first MLB win, Aug. 19 at ATL...Opposing MLB hitters posted a .200 average and a .277 on-base percentage...Held Minor League batters to a .197 average against in 56.0 innings pitched...Entered the season rated as the No. 19 prospect by MLB.com and the No. 30 prospect in Washington's system, per Baseball America. Went 1-1 with a 1.80 ERA (6 ER/34.0 IP) in 19 games between short-season Single-A Auburn and Single-A Hagerstown...Struck out 38 and walked just two batters...Was 5-for-7 in save opportunities...Surrendered just one earned run in his first 17.0 IP (0.53 ERA), spanning 11 outings. 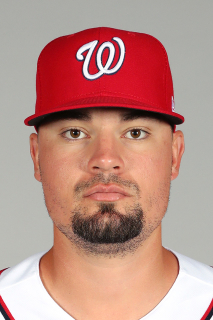 March 27, 2019 Washington Nationals placed RHP Koda Glover on the 10-day injured list retroactive to March 25, 2019. Right forearm strain. August 8, 2018 Washington Nationals recalled RHP Koda Glover from Syracuse Chiefs. July 22, 2018 Washington Nationals optioned RHP Koda Glover to Syracuse Chiefs. July 22, 2018 Washington Nationals reassigned RHP Koda Glover to the minor leagues. July 18, 2018 Washington Nationals sent RHP Koda Glover on a rehab assignment to Syracuse Chiefs. July 14, 2018 Washington Nationals sent RHP Koda Glover on a rehab assignment to Potomac Nationals. July 7, 2018 Washington Nationals sent RHP Koda Glover on a rehab assignment to GCL Nationals. March 28, 2018 Washington Nationals placed RHP Koda Glover on the 60-day disabled list. Right shoulder tendinitis. November 3, 2017 Washington Nationals activated RHP Koda Glover from the 60-day disabled list. July 17, 2017 Washington Nationals transferred RHP Koda Glover from the 10-day disabled list to the 60-day disabled list. Lower back stiffness. June 11, 2017 Washington Nationals placed RHP Koda Glover on the 10-day disabled list. Lower back stiffness. May 12, 2017 Washington Nationals activated RHP Koda Glover from the 10-day disabled list. May 10, 2017 Washington Nationals sent RHP Koda Glover on a rehab assignment to Harrisburg Senators. April 26, 2017 Washington Nationals placed RHP Koda Glover on the 10-day disabled list. Left hip impingement. October 14, 2016 Washington Nationals activated RHP Koda Glover. October 7, 2016 Washington Nationals reassigned RHP Koda Glover to the minor leagues. August 17, 2016 Washington Nationals recalled RHP Koda Glover from Syracuse Chiefs. July 24, 2016 Washington Nationals optioned RHP Koda Glover to Syracuse Chiefs. July 20, 2016 Washington Nationals selected the contract of Koda Glover from Syracuse Chiefs. June 20, 2016 RHP Koda Glover assigned to Syracuse Chiefs from Harrisburg Senators. April 29, 2016 RHP Koda Glover assigned to Harrisburg Senators from Potomac Nationals. April 5, 2016 RHP Koda Glover assigned to Potomac Nationals from Hagerstown Suns. July 8, 2015 RHP Koda Glover assigned to Hagerstown Suns from Auburn Doubledays. June 25, 2015 Washington Nationals signed RHP Koda Glover. June 25, 2015 RHP Koda Glover assigned to Auburn Doubledays.